Strawberry season is in full swing making them an abundant and frugal option for snacking and treat making. Chocolate and strawberries go together like honey and hot biscuits, or bacon and eggs. Chocolate covered strawberries are the perfect treat for any picnic, or summertime gathering. Make them extra special with a dollop of whipped cream. You can use any type of chocolate you prefer. We love a deep, dark chocolate, but white or milk chocolate will work just as well. Chocolate chips are perfect for melting as the small chips melt evenly and easily. Dipping the strawberries is an easy task for a child age 8 and up, but use caution as the chocolate will be hot. Teach them to hold the green steams while dipping the strawberries. Liven your strawberries up with sprinkles or chopped nuts. Make it a family affair and have some double-dipping fun! In a double boiler melt the chocolate chips over low to medium heat, stirring often. Meanwhile, line a cookie sheet with parchment paper. 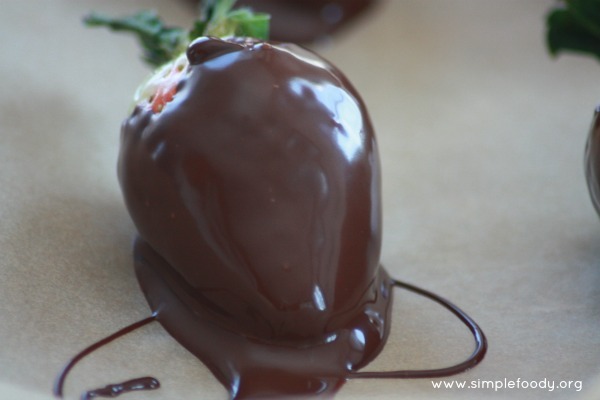 Once chocolate is completely melted, take a strawberry by the green top and gently dip each side into chocolate, ensuring each side is well coated. Place chocolate-covered strawberry onto parchment lined cookie sheet. Repeat steps 3 and 4 until all the strawberries are covered, and then place cookie sheet into the fridge to allow chocolate to cool and harden, about 20 minutes. Yum, Katie! So simple and elegant. Can’t imagine they’d last long here with all of our littles!